Though our time in Quito was short, it was easy to see that this is a wonderful and vibrant city and one that I would come back to visit in a heartbeat. I am sure that other South American cities sitting high in the Andes are also worthy of exploring, but Quito will now have a special place in my memory as being the first and hopefully not the last. As we descended south out of the city on the windy two-lane road that serves as the main artery for those not willing to pay the toll for the huge multi-lane highway and tunnel leaving the city (clearly our taxi driver) we look back up at the steep slope towards Quito sitting high in its long valley between majestic peaks. The many high-rise apartment buildings sit seemingly perilously on the precipice with their amazing views south towards Cotopaxi, yet clearly vulnerable to earthquakes and mudslides. It is clear that this city, with its centuries of tradition, lives on the edge, both literally and figuratively. I will do my best to return and explore again. 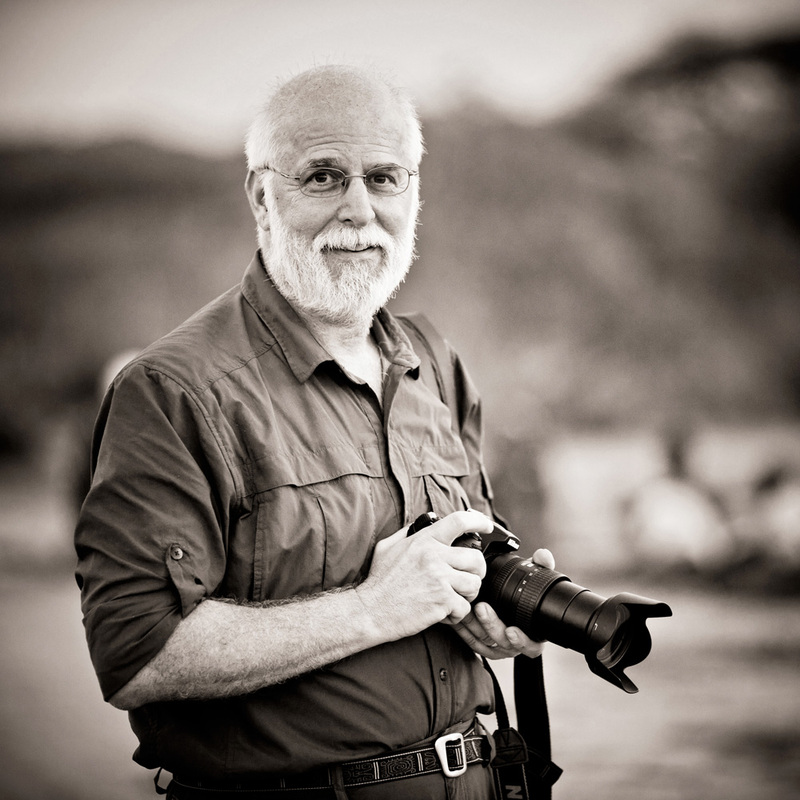 The airport at Quito serves as one of two gateways to the Galapagos (Guayaquil, on the coast, being the other) and as you enter it is clear that our destination is on many a bucket list. As we begin the process of embarking, everything must go through a scanner and our bags are secured when they hand them back to you so nothing is left up to chance and nothing can be brought to the islands that shouldn’t be there. The flight out of Quito is spectacular as it ascends over the Andes on its way to the coast in a very short time and then it’s all Pacific Ocean until we begin the descent to our destination. The islands are like incredible jewels laid randomly on a dark blue fabric. Luckily, the flight begins to bank in my direction and continues to slowly spiral dropping altitude directly over the island of Santa Cruz, where we’ll be staying, and Baltra, an adjacent smaller island with its airport. The views are amazing and I’m certain I can see schools of dolphin or at least something large, though perhaps they are only whitecaps playing games with my eyes. 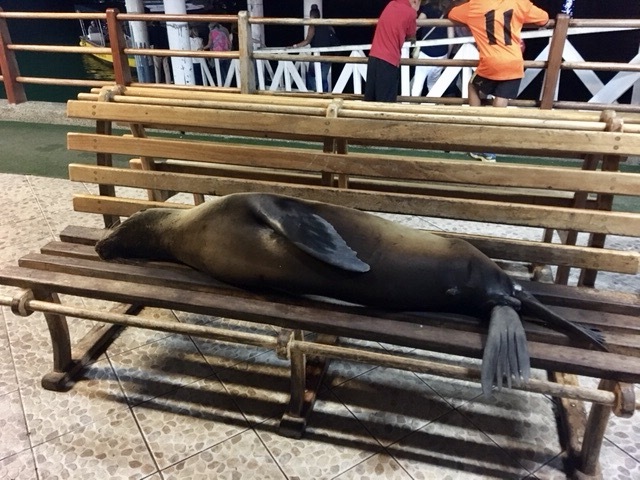 After going through the Galapagos Park entrance (a bit complicated since we somehow didn’t pay our “emigration” fee of $20 from Quito – not quite sure how that makes sense given they’re the same country) where we had to pay another $100 as the park fee, we found our bags. We had carried them on all the way to Quito, but the “luggage police” finally caught up with us there and we had to relinquish as the woman seemed quite stern and posed a formidable adversary given that neither of us spoke fluent Spanish. Thankfully, there were no issues and we soon found our taxi driver, Marco, who would bring us to Puerto Ayora, the port town on Santa Cruz and everyone’s destination who can’t afford to stay at the Royal Palm (for movie stars only according to Marco) and are planning to do a land based tour. 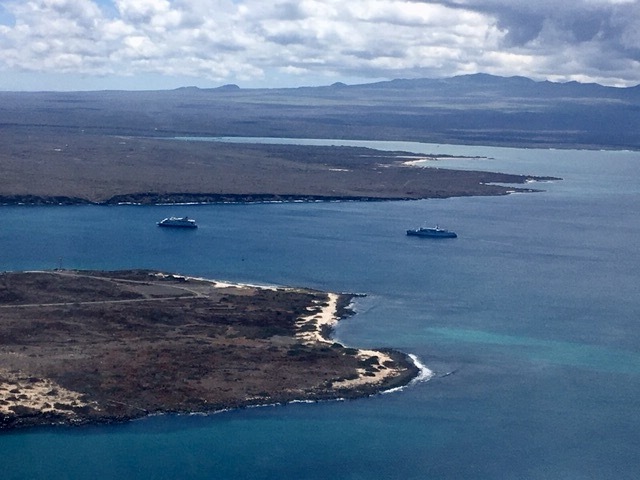 The two ways to see the Galapagos are on a cruise where you visit a number of islands and sleep and eat aboard boat, or the land based tour, where you typically stay on one island and take day cruises to some of the other islands that are close by. The benefit of the cruise is that you sail between islands at night and don’t waste any daylight having to travel between the islands. The downside is that they are very costly. 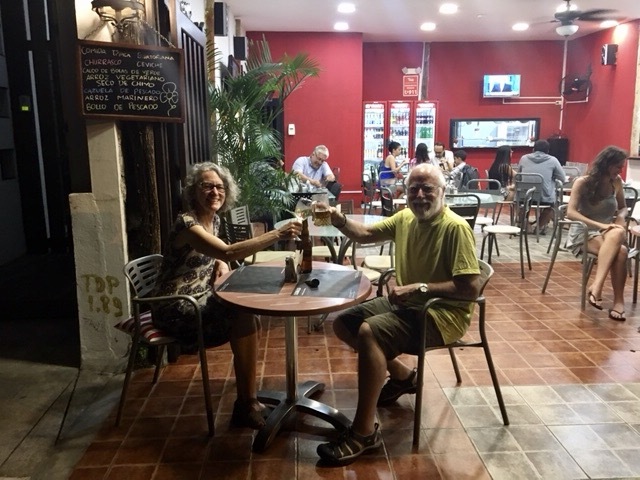 Kathy and I had planned for the less costly option and planned to do a land based tour in Puerto Ayora while visiting the islands of Bartolome and North Seymour. 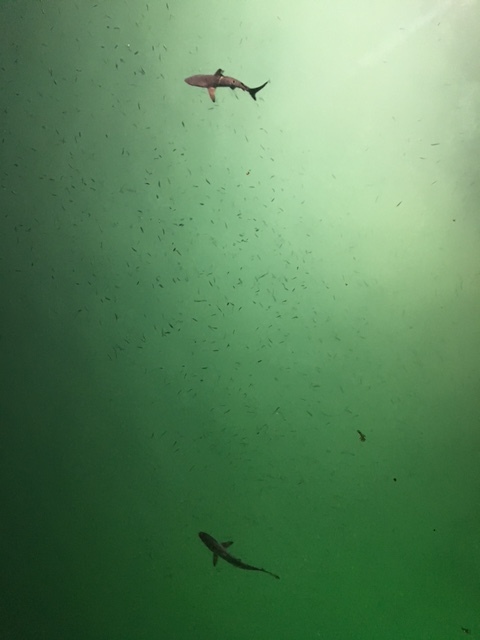 I had also planned to do one day of scuba diving while here as I didn’t want to miss that experience given where we were. We found an amazing place to stay on AirBnB called Encantada Blue. This little two-story house has upstairs and downstairs apartments for rent and sits adjacent to the trail to Tortuga Beach, a very popular and beautifully beach just outside of town. Aura, who owns Encantada and works as a naturalist on one of the cruise boats met us to show us around. 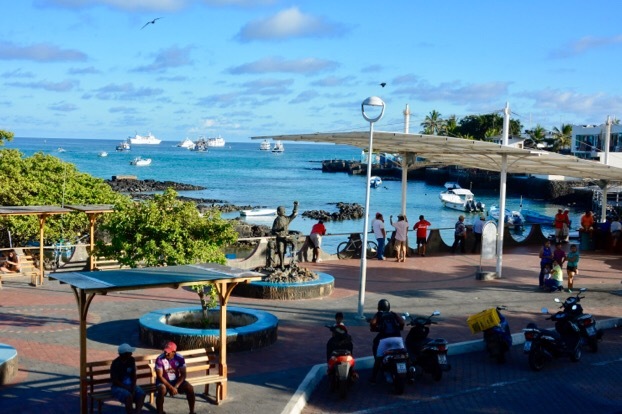 It has everything we need and will serve well as our base while here in Puerto Ayora and as we explore the Galapagos and the island of Santa Cruz. After cleaning up we went on to explore town and to arrange for our day cruises and my diving. It takes literally 20 minutes or less to walk across town which we managed to do several times while making our travel arrangements. 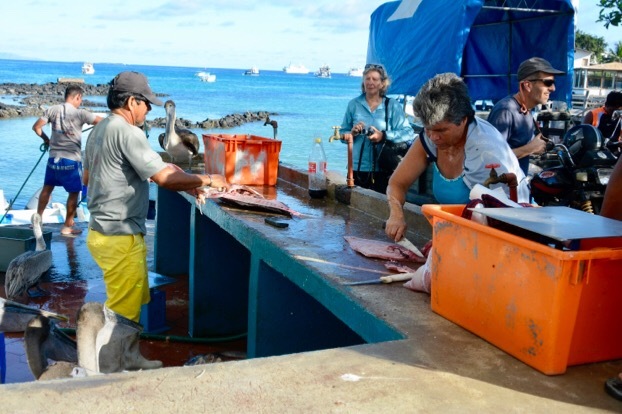 The main drag that follows the curve of the port in town is called Avenida Charles Darwin and runs past the municipal pier, where one picks up water taxis to cross the harbor to finch bay, and the fish market, where fisherman bring in their freshly caught fish to sell to people waiting in line. Brown pelicans surround the market along with a lone sea lion sitting at everyone’s feet waiting for a tasty snack. It was a true island sight. After we had taken care of all of our business including a stop at the grocery store for supplies, we headed out for dinner. We had recommendations from Aura and our friend, Diego, in Quito, and both had highly recommended Lo y Lo, a local’s seafood restaurant serving Ecuadorian cuisine. I had a special dish of fish in a spicy sauce also using coconut milk and Kathy had an amazing octopus (pulpo in Spanish) dish. We sat outside on the street and totally enjoyed our incredible meal in the warm island sea air while making plans to the following day which was our only full free day on the island. It was a mere two block walk back to home and we slept with thoughts of Tortuga Beach where we’d be heading in the morning. Amazing photos! Cheers to you Mike and Kathy!